LA BAIE DES ANGES - Artwork by Marc Chagall. 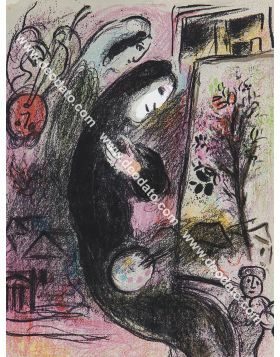 Wonderful color lithography by Chagall, from the illustrated book: "Chagall Lithographe" of 1960 by Julien Cain, Marc Chagall and Fernand Mourlot. Published on the catalogue: "THE ILLUSTRATED BOOKS - MARC CHAGALL" by Patrick Cramer publisher, pag. 148. 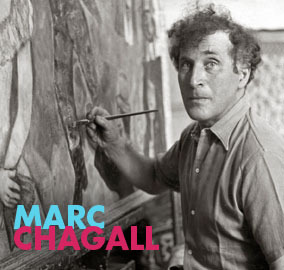 Marc Chagall was born on 7th July 1887 in a poor Jewish family. When he was 9 years old he succeeded entering the Jehuda Pen's atelier, one of the most important names in the world of Jewish and Russian art. One year later, he attended the School of Imperial Society for Fine Arts protection in San Petersburg. His first exhibition was the one at the Salon des Independants in 1912 and later at the Herbstsalon, the first German autumnal salon. After these two episodes he finally could organize his first solo show. 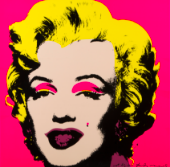 He realized many projects such as 19 great circus themed gouaches, 107 etchings belonging to the Dead Souls cycle and the series of the illustrations dedicated to the Holy Bible created during 1930. Choosing bright and vivid colors Chagall wanted to transmit happiness. His colorful world reminds the stained glass windows of churches, with recalls of Russian art of the early Twentieth Century made of simple shapes expanding till they create spots and beams of beautiful colors.